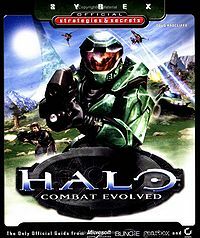 Halo: Combat Evolved: Sybex Official Strategies & Secrets is a strategy guide for Halo: Combat Evolved, more specifically its PC version. It was authored by Doug Radcliffe. What makes Radcliffe's book unique among the many strategy guides available is that it contains Halo Story Bible canon information. So not only is it a good source for tips and tricks, but it also offers Bungie approved insights into the Halo Universe. Complete single-player walkthrough so you can survive and complete Legendary difficulty. Analysis of every weapon, vehicle, and enemy in the game. Full compilation of Halo Easter eggs!